For Ian Anderson Gray, the two main joys in life have always been technology and music. And he’s been lucky enough to have made careers for himself from both of his passions in life. When he came to that scary moment in his life when he had to decide what he wanted to do with the rest of his life, he chose to pursue a career in music. In fact, he’s studied it at university and became a trained musician from the Royal Northern College of Music in Manchester. But he was always involved in technology. In 2003 he launched a web design agency where he designed websites for his colleagues, in between the professional singing. In 2010 he then set up his own blog where he talked about social media and the technologies involved in it all. And from there, it’s grown. And just last year, in 2015, Ian was asked to speak at a conference. However, his performing experience kept his nerves at bay, and now his knowledge and love of social media have been recognized. So let one of the UK’s top social media influencers teach you a thing or two about social media and the power of live broadcasting. Ian’s journey to becoming regarded as a social media expert was never one he intended on actually taking. He purely set out to write about the things he found interesting, and to help people understand the techno-babble company’s use. For example, the information Twitter gives to developers is in a language which is almost incomprehensible to humans. He helps people to get their head’s around this so that people can pick the right social media tools for themselves. But he’s also found notoriety because of his unique style of writing blog posts to himself, and not being afraid of controversy. In fact, his blog post 7 Reasons Why You Should NOT Use Hootsuite is one of his most-visited website pages. However, he’s always been happy to put himself out there, so that people can ask him any questions they have regarding social media. The point of a social media tool is to actually work and make life easier for the user. However, before you set about choosing, you need to actually know what you want it to help you to achieve. For example, if you wanted help posting your social media updates, then you may want a scheduling tool such as Buffer. The Power Scheduler feature allows you to share something on multiple platforms at different times. Or, Ian also recommends checking out Missing Lettr. It will analyze your latest blog post and come up with a marketing plan for it. It does this by extracting content from the post and then sharing it multiple times over the next year. There are different price plans available, including a free version of the tool. Ian certainly feels that 2016 is the year of the live video. As smartphones are getting more powerful, they are more than capable of streaming live content, and improved data plans are recognizing and enabling that. Periscope for Twitter was massive last year, and this year Snapchat is achieving 11 billion daily video views. However, as YouTube trails behind with live video, Facebook Live leads the way at the moment. This is in part thanks to the enormous reach it has due to the sheer number of members it has. But it’s also aided by Facebook prioritizing their own live video tool over the competition. When you’re looking to get started, Ian recommends using a mobile device as the best place to start. Your very first go must be a private trial you do on your own Facebook profile. That way, you can ensure you’re completely ready for when you do start. Before you do go live in front of an audience, you must have a plan first; even if it just consists of a few bullet points for what you want to discuss. And keep it short and sweet, with an ideal time being between 3 and 5 minutes. But don’t get hung up on a lack of viewers, especially on your first few runs. You can never expect to start out with a huge audience. Partly because a lot of people watch it after it’s gone out live. The key is consistency. Go live at the same time every day or week. That way, you’ll become a habit for your audience. But also make sure you give your audience plenty of notice, so they have the best chance of being ready and waiting for you. And if things don’t go to plan, don’t dwell on the mistakes. The more you do, the better you’ll become. But also, people are far more forgiving with live broadcasts, and it adds to the experience. It’s something any business can do, regardless of how boring your business might be. It will help you to stand out as an expert, especially if no-one else in your sector is doing it. There’s always something to say or do, even if you’re just showing what happens behind the scenes. All you need to do is show your personality and passion. Social media can become time-consuming and ineffective. But Ian has a few quick tips to help change that. Not only will you do it better, but you’ll also have more time to do the things which keep your business running, and growing. -Have set times in the day for your social media work, such as engaging with your followers. There’s no need to reply to messages the instant they come in. -Schedule your social media posts. Batch out a load in one go, and they will all post whenever you want. It takes less time and it’ll still happen even if you forget. -Make sure that when you do broadcast live, you stick to the same time and don’t overrun. However, you need to also ensure the time you go out live is the right time for the viewers you’re trying to reach. 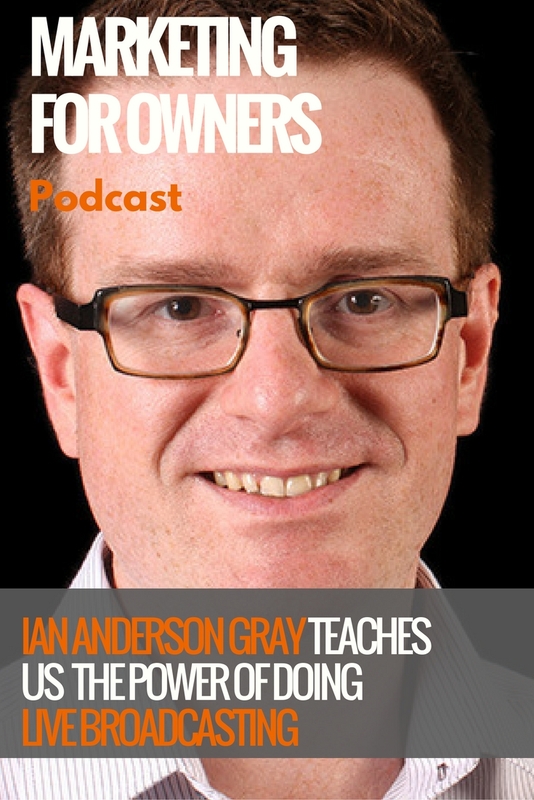 To find out more information about Facebook Live, and how it can help your business, visit Ian Anderson Grey’s website to read his blog posts which are full of advice on how you can get started. If you want to learn more about Facebook Live and how it can help you in your business, be sure to sign up for his course here. But you should also head there to learn everything you may ever want to know about social media and the tools available.